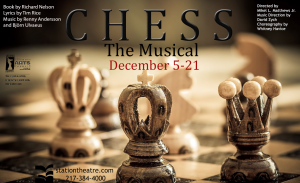 The Rice/Andersson/Ulvaeus musical Chess is playing in Urbana in December at The Station Theater. Details from a received email below. 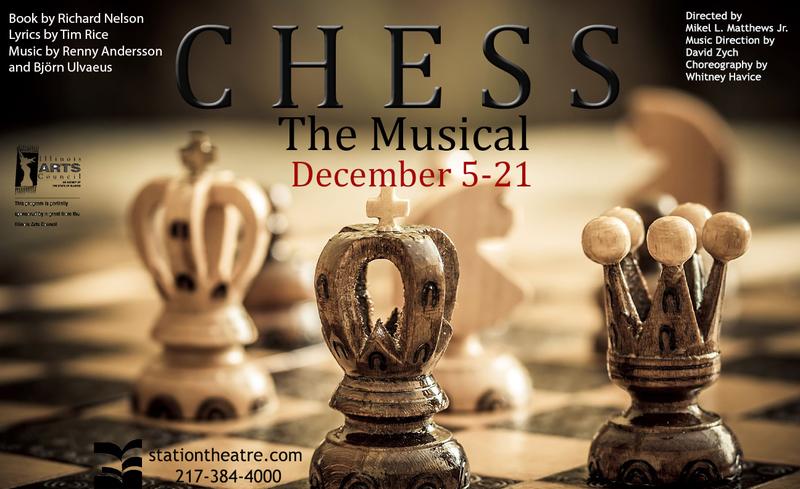 CHESS is a story of love, duty and sacrifice set against the backdrop of 1980’s glasnost and the World Chess Championship. It was inspired, in part, by the Cold War-era Championship match between Bobby Fischer and Boris Spassky. At the forefront are the two chess masters: Freddie Trumper, a brash, cocky American who enjoys his rock star status in the chess world; and the Russian player Anatoly Sergievsky, the current champion and Freddie’s opposite in almost every respect but mastery of the game. All too soon Freddie’s temperamental nature causes problems not only for Anatoly, but for their chess seconds (Florence Vassy and Ivan Molokov) and the tournament’s Arbiter. Tying the story together is a strongly thematic and intricate musical score, with lyrics by Tim Rice (“The Lion King” et. al.) This show spawned the 1985 Top 5 hit “One Night in Bangkok,” and the ballad “I Know Him So Well” has been covered by Whitney Houston and Barbra Streisand. The Station Theatre is a small (approx. 100-seat) black-box theatre sited in a converted train station, one block west of US 45 off University St. in Urbana. Despite its small size, The Station has successfully staged full Broadway musicals as well as smaller dramatic and comedic plays. They produce as many as ten shows each season. This entry was posted on Tuesday, December 3rd, 2013 at 1:54 pm	and is filed under All Pages, Events, Past Events. You can follow any responses to this entry through the RSS 2.0 feed. Both comments and pings are currently closed.